It's nearly the Day of the Dead in Mexico, which gives us the perfect excuse to get familiar with the country's national spirit: tequila. Or wait, should that be mezcal? And what's the difference, anyway? In this episode of Gastropod, Cynthia and Nicky travel to Mexico to explore the history and science of distilled agave, and get tangled up in a complex story of controversies, clones, and culture. 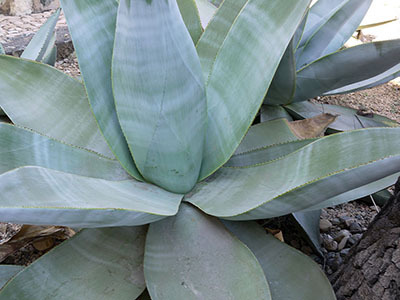 The agave, a spiky succulent native to Mexico, has been at the center of indigenous life in the country for millennia: it can be used to make rope, nails, bandages, soap, and snakebite cures. But the plant's real attraction, then as now, is its sweet sap and fleshy core, or piña. Traditionally, the nectar was drunk fresh or fermented to create a milky, sour alcoholic drink called pulque, and the piña, which when roasted tastes something like smoky sugarcane with overtones of yam, was eaten. But, at some point—no one knows for sure whether it was before or after Spanish colonization—Mexicans began crushing those roasted piñas to extract a caramel-colored juice that they fermented and then distilled. The result: mezcal, a clear, strong agave liquor whose name comes from the Nahuatl words metl (agave) and ixcalli (which translates to "cooked" or "baked"). For centuries, all agave distillates were called mezcal. Then, in the nineteenth century, the producers near the town of Tequila, in the state of Jalisco, began to differentiate their mezcal—mezcal de Tequila—by building a reputation for quality and scaling up production for export. Eventually, mezcal de Tequila became tequila, which, in turn, became the iconic spirit of Mexico. Today, however, tequila is passé. While tequileros turned agave cultivation and distillation into an industry, families all round Mexico continued to harvest cultivated and wild agave and use traditional methods to make mezcal. Their activities were frequently illegal, and the results varied wildly. But, over the past four or five years, mezcal has taken off: bartenders, chefs, and drinkers in Mexico, and, increasingly, in the United States and Europe, have begun to seek out tequila's smokier, more artisanal cousin, and savor the flavors of different agave varietals and production methods. And yet some worry that mezcal's success holds the seeds of its downfall. In this episode, we dive into the controversial, occasionally violent arguments over the definitions of tequila and mezcal, we hear from a pioneering female mezcalera who represents the future of the drink, and we track down a mezcal scientist to shed light on that mysterious worm at the bottom of the bottle. In between, we hang out in Mexico City and Oaxaca, and share mezcal stories and sips with chefs Enrique Olvera and Wylie Dufresne, food writer Ruth Reichl, and more. Listen now, and then tell us your tequila tales or mezcal moments. ¡Salud! Sarah Bowen is associate professor of sociology at North Carolina State University. She's the author of Divided Spirits: Tequila, Mezcal, and the Politics of Production, a new book that looks at the evolution of these two iconic spirits, and the impact of the Denomination of Origin on both. Gary Paul Nabhan and ¡Tequila! Gary Paul Nabhan is the W.K. Kellogg Chair in Southwest Borderlands Food and Water Security at the University of Arizona. He is an ethnobiologist, agroecologist, conservation biologist, and cultural geographer, and the co-author, with Ana G. Valenzuela-Zapata, of ¡Tequila! : A Natural and Cultural History. 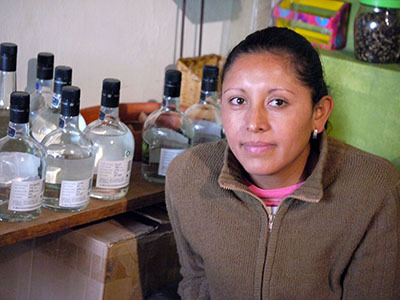 Graciela Carreño's family has made mezcal in Santa Caterina Minas, near Oaxaca, for generations. Now, she heads her family's mezcal company, Real Minero, which sells organic mezcal not only in Mexico, but in Washington State, Texas, California, and New York. Cynthia met Graciela through Marco Ochoa, founder of Mezcaloteca in Oaxaca. It looks and feels like a bar, one with nothing but straight mezcal. But it's also a store; they work directly with producers to eliminate third-party bottlers. They offer tastings, accompanied by geeky talks filled with info about mezcal. Highly recommended. Nicky visited Mexico City thanks to the generosity of chef Enrique Olvera's Mesamérica initiative, which brought chefs and food writers from all over the world together for the Mesa Redonda panel discussion in September 2015. While there, she had the chance to hang out and drink mezcal with the legendary Ruth Reichl (who also just came out with a new book), star chefs Alejandro Ruiz, Benito Molina, and Wylie Dufresne, and food-focused architect José Castillo. There are many great articles out there about mezcal and tequila. We mentioned one on agave from an 1885 edition of Scientific American, as well as this Mother Jones article by Ted Genoways on the environmental issues surrounding tequila. Eater published a recent article all about mezcal, and Smithsonian Magazine has a piece on the history of the margarita. All photographs by Cynthia Graber.